Stop hurting your brain; my title makes no sense whatsoever. Well, it does to me but not to anyone else. You see, when I was attending UConn the library was wrapped in a giant sheet of plastic as if Christo had his worst installation ever there for years on end. The line, “She’s dead. Wrapped in plastic,” is of course the iconic “Twin Peaks” exclamation said by Pete Martell upon discovering Laura Palmer’s lifeless body on the beach. Now that that’s out of the way, I’ll address your second question. 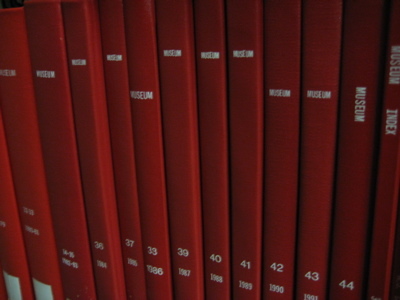 “Since when does a library warrant CTMQ inclusion?” Since this library contains permanent art exhibits, several other exhibitions, as well as a massive historical map collection that really could stand alone as a museum. If the map room existed when I was a student, I’d have hung out there rather than down the hall playing SEGA Hockey ’93. And ’94. Ah yes, and ’95. Good times. 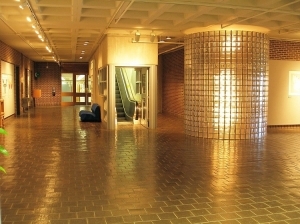 The Dodd Center is a newer building behind the library that houses special collections and archives, as well as a couple museum-quality exhibitions as well. In fact, these two buildings are so intriguing and the collections/exhibitions are so interesting, I would really like to re-visit soon. And I don’t say that too often, with all the stuff I have yet to visit. 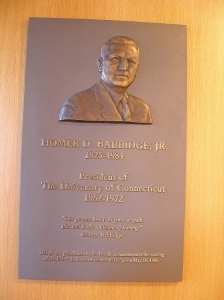 Any way you slice it, the Babbidge Library and the Dodd Center definitely warrant CTMQ inclusion. 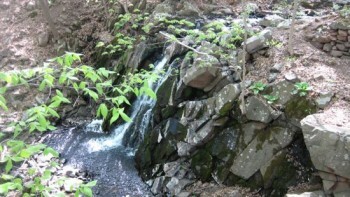 Lida Skilton Ives was a prominent western Connecticut citizen of the mid-20th century: a mother, businesswoman, community historian, writer, Grange leader and rugger. Prompted by the thrift-minded WPA era and inspired by the Arts and Crafts movement, Lida eventually hooked a substantial but never fully documented number of rugs from the 1940s through the 1970s, using recycled woolens and simple burlap backing. And here I thought “ruggers” where the big burly tough guys in the middle of rugby scrums. Although Lida married a UConn alumnus and was the mother of four UConn graduates (and the grandmother or great-grandmother of three others), she never earned a college degree — one of her life regrets. Ironically, she has finally made her UConn debut through her rugs. 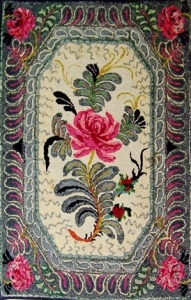 The rugs on display are a sampling of more than 100 surviving pieces owned by family members from several states. 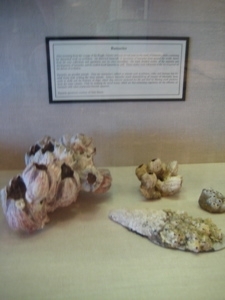 A small collection is also housed at the Morris Connecticut Historical Society. Now… the true test. Will I remember to link that report when I visit there? Yes, the Babbidge Library does have the greatest magazine in the world with the best freelancers ever. Her rugs were nice I suppose. But subsequent exhibitions seem a bit cooler to me. Like the Portraits in Glass, by Debbie Tarsitano for instance. Some of her stuff is really beautiful – you can check out a video of it here (but you may want to mute the Lillith Fair music). Currently, as of this writing (and why I say I’d like to get back up there this summer), exhibits include The University of Connecticut in Kodachrome, 1939-1959 and Capturing the Stars : The Astrophotography of Robert Gendler. I really like good photography and I am certainly interested in both subjects featured here. So much to see, so little time. Venturing down to the basement level and the Stevens Gallery, another exhibit entitled Familiar Terrian: Joan Jacobson-Zamore, Printmaker really didn’t do much for me either. (Boy, I’m really convincing myself to go back!) 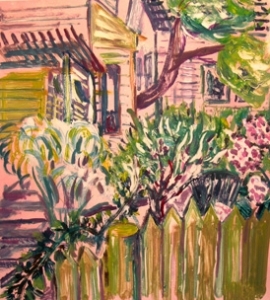 Many pieces in the show are monotypes made in the plein air style, but other printing techniques are also in evidence. For example, lithography is combined with block printing in some of her large-scale prints. Yeah, the current photos are definitely more interesting. Back up and out to the new Bookworm Café that didn’t exist when I was a student, the permanent exhibit Endangered Species is on display. Created by internationally known sculptor Werner Pfeiffer, the sculpture uses books that have been sealed shut, then mutilated, and placed on shelving lined with pages from the dictionary, making a compelling statement about the power of the written word and censorship. The work, which measures seven by twenty-four feet, was created in the 1980s and exhibited throughout the United States and Europe. I went back into the library and up to the 4th floor where the glorious map room drew me in like a moth to flame. Like MAGIC. 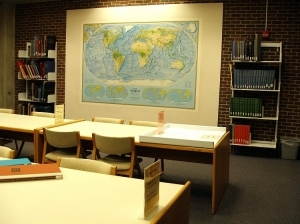 Did I say “magic?” The University of Connecticut Libraries’ Map and Geographic Information Center (MAGIC), collects maps, atlases, gazetteers, aerial photographs, and digital geospatial data pertaining to the state of Connecticut, New England and the world. 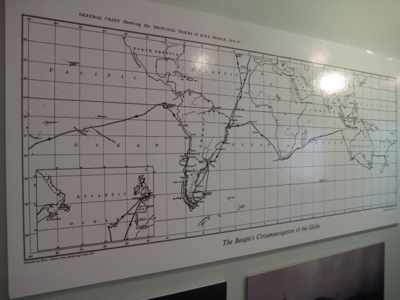 MAGIC digitizes public-domain and copyright free maps and resources in order to enable researchers to have digital access to this resources. 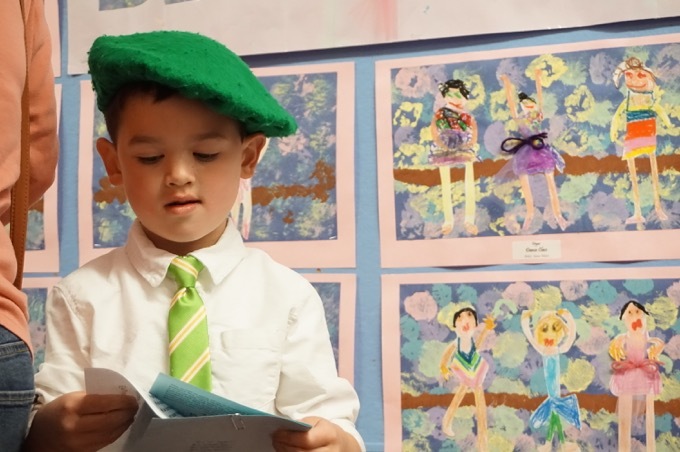 MAGIC’s is focused on “Digitizing the Past to Empower 21st Century Research” as they work to develop a interdisciplinary collection of geospatial resources and maps which focus upon the state of Connecticut. MAGIC provides assistance with GIS questions, Web Map Service (WMS), and Mash-ups utilizing data on the MAGIC website. I had to get out of there before I grew too attached. Straight down the stairs (I never waited for the elevators when I was in school, so why start now?) 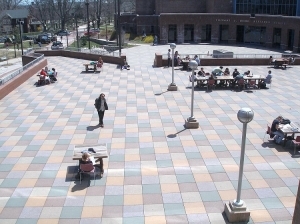 and out the new cafe (it used to be “The 24 Hour Study Room” where smoking was allowed) into the courtyard and over to the Dodd Center. 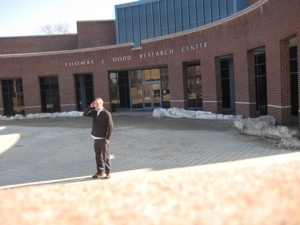 Ground was broken for the Thomas J. Dodd Research Center on October 10, 1993, and the finished building was dedicated by President William J. Clinton on October 15, 1995. It is named for the late Senator Thomas Joseph Dodd whose son, Senator Christopher J. Dodd, played a crucial role in the Center’s development. The dedication ceremony inaugurated “The Dodd Year”, a year-long series of special events, speakers, exhibits, and colloquia. Devoted to the theme of human rights, The Dodd Year recalled Thomas Dodd’s participation as a senior prosecutor in the International Military Tribunal, the first of the Nuremberg War Crimes Trials. Funny note: I actually went to see Clinton speak that day, but had completely forgotten why I ever saw him speak. I have a picture somewhere of myself and a few other guys in our terribly cheap shirts and ties rarin’ to go see Bubba, but a cursory look didn’t turn it up. I did, however, find the program and ticket stub. Oh, and I had a good friend then named Mike Dodd. I wonder if he knew it was his year. There is a state of the art reading and research room here, but that’s not why I was there. 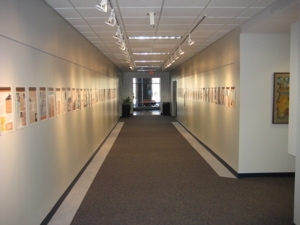 The exhibit gallery is located directly off the main lobby and provides a well-designed facility with state-of-the-art cases to enable the Dodd Research Center to maintain an ongoing exhibition program, highlighting the rich and varied materials housed in the collections. In addition to the exhibits here, I must mention their “electronic exhibits” online. I just go lost in them; they are awesome. Take, for instance, the one on Railroad stations of Southern New England which links to The Dodd Center’s Railroad History Collection which links to… Sigh. Focus. The main exhibit during my visit was “Charles Darwin (1809-1882): The Legacy of a Naturalist.” Since I got my Ecology and Evoutionary Biology degree from UConn, I was looking forward to the exhibit. Interestingly, they made sure to highlight the fact that Darwin was a “mere” naturalist who happened to stumble upon Natural Selection through his studies. 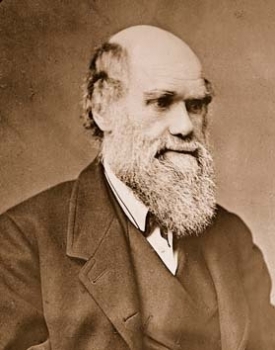 Even if for some strange reason you refuse to accept the fact of evolution, you must recognize Darwin’s incredible contributions to the studies of such varied animals as barnacles and earthworms. 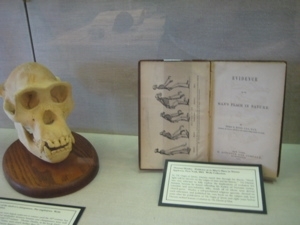 The exhibit featured rare books, prints, natural history specimens, and other artifacts to illustrate the life and career of Charles Darwin. 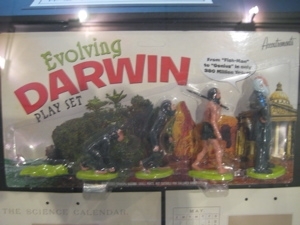 2009 marks not only the 200th anniversary of Darwin’s birth, but also the 150th anniversary of the publication of his most famous book, On the Origin of Species. 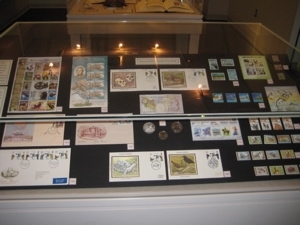 The exhibit also featured other learned members of his family and there was also a section that dealt with commemorations of Darwin and his work, beginning with his burial in Westminster Abbey, and with Darwin as a cultural icon, as reflected in the widespread use of his image on postage stamps, coins, trade cards, advertisements, and even childrenâ€™s toys. I enjoyed it all very much. 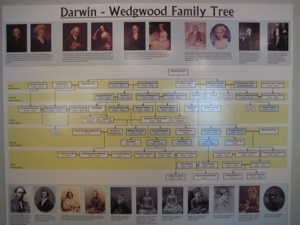 I didn’t really learn anything new – did you know Darwin’s wife was a descendent of the famous Wedgewood family? – but I always enjoy Darwinalia. Then I went down the hall to the other exhibit. 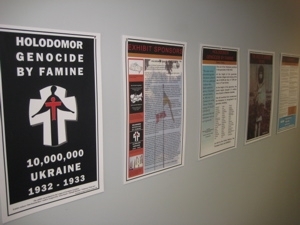 “Holodomor: Genocide by Famine.” Ugh. It has been called “the crime of the century that nobody’s ever heard of.” In 1932 and 1933, up to 10,000,000 people of Ukraine died by starvation as a result of deliberate actions taken by the Soviet regime of Joseph Stalin to systematically destroy the Ukrainian people’s aspirations for self-determination and independence. As of this writing, there are different exhibits; one on New Haven’s old timey garment workers and another, far cooler one titled, “Train Wreck! Crashes, Calamities and Catastrophes in Connecticut.” Awesome. Maybe I’ll have to pop in to check this one out too. 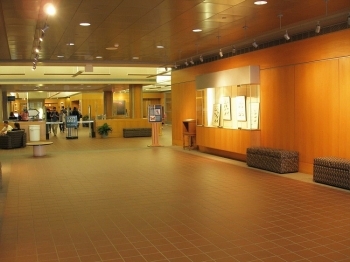 Taken together, the Library and the Dodd Center always have at least 4 museum-quality exhibits on display. And you can almost always be assured at least one of them is worth your while. 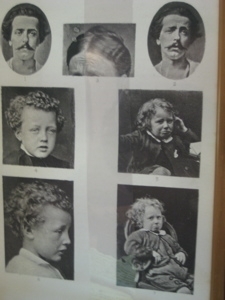 A study of emotions – that’s my Damian bottom right. And some barnacles.